Our stay at the Wingate by Wyndham in North Charleston was perfect. The hotel was very nice and easy to access from I-26. The room was clean and very spacious and had a comfortable bed. A variety of foods were provided at the morning breakfast buffet. The staff were friendly and very helpful. We left our vehicle parked there during our cruise and when we returned, it was just as we had left it. We couldn't have been more happy with this Park and Sleep hotel. We would definitely recommend this hotel to anyone. Stayed over night to take a cruise and was very pleased. Rooms clean and well maintained. Would stay here again! The Wingate in North Charleston was a great hotel . It was clean and had spacious rooms. Everyone was very hospitable. We will certainly stay there again if the need arises. Check in was fast and easy. Property, lobby and rooms were nicely maintained. The hotel-suggested shuttle to the cruise port was a bit late picking us up, but was comfortable and reasonably priced. I appreciated the comfortable bed, microwave and refrigerator, wifi speed and nice toiletries. I also had no reservations leaving my car at the hotel for a week. The breakfast and coffee in the lobby was also a nice touch. This hotel is not close to the port; keep that in mind when planning your return to pick up your car. 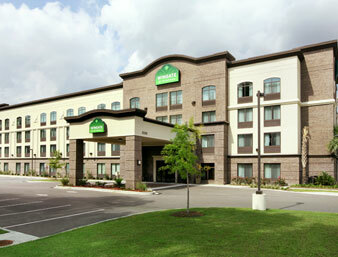 This hotel is perfectly located for a Park/Sleep/Fly beginning to a vacation starting in Charleston. The airport is only 10 minutes away. The rooms are large and very well appointed. Wished we could have actually stayed longer than what we did. We arrived kind of late and had to leave early that morning after breakfast to get to our cruise.